I feel extremely happy after hearing about the beatification of Monsignor Romero. For all of us in El Salvador, as for many people around the world, he has been a martyr and a Saint from the day he was murdered. 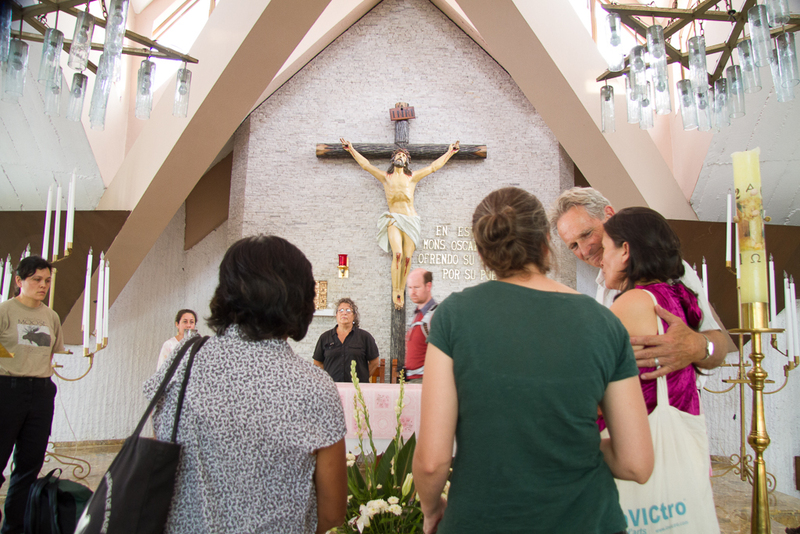 Delegation visits the chapel at Divina Providencia, where Romero served and was murdered. It took 35 years for the Catholic Church to recognize him as a Saint of the Church. But the people of God had recognized him as a man of God, as a pastor, as a prophet, as a Saint in his worldly life as he walked at the side of the poor in El Salvador. His people declared him a martyr right after his murder. The people of God (the people of El Salvador) came to know him in the breaking of the bread, in walking with the poor, when he spoke out for us, and when he denounced the injustices of those times. “The Spirit of the Lord is on me, because he has anointed me to proclaim good news to the poor. He has sent me to proclaim freedom for the prisoners and recovery of sight for the blind, to set the oppressed free (Luke: 4:18). Today we celebrate his life, but more than that we celebrate the resurrection of the church. We celebrate today the birth of an opportunity for building real justice. We celebrate and we hope that the cries of the many families who call for justice can be heard and that the beatification of Oscar Arnulfo Romero Galdamez becomes the door to the construction of true peace. I want to share a dream and invite others to dream with me. My dream is this: that Romero’s beatification will open a door to attaining real justice, because only then will we reach peace in this little but giant nation, El Salvador. This entry was posted in El Salvador, General and tagged Romero, staff reflection. Bookmark the permalink. Thank you! Your reflection on Oscar Romero and his call to love and justice was beautiful and timely.